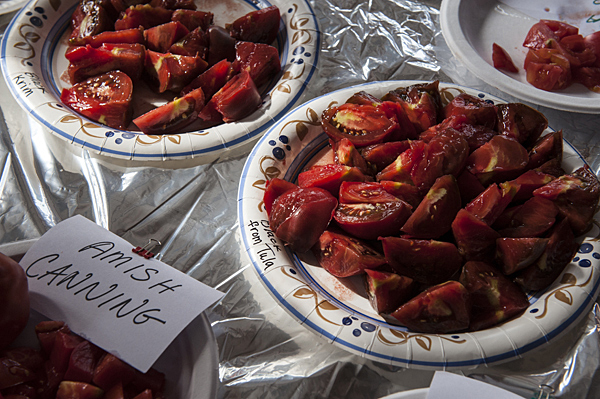 Fifth Annual Tomato Tasting, A Success! – Tomato Town organically grows heirloom tomatoes in the greater Kansas City area as well as Johnson County, Leawood, Lenexa, Olathe, Shawnee, Merriam KS, Independence MO and Kansas City Missouri, KCMO. Varieties include: Cherokee Purple, Brandywine, Stupice, Carbon, Black Krim, Black Cherry, Yellow Pear, Absinthe and Aunt Ruby’s German Green. The crowd hovers as James slices specimens. 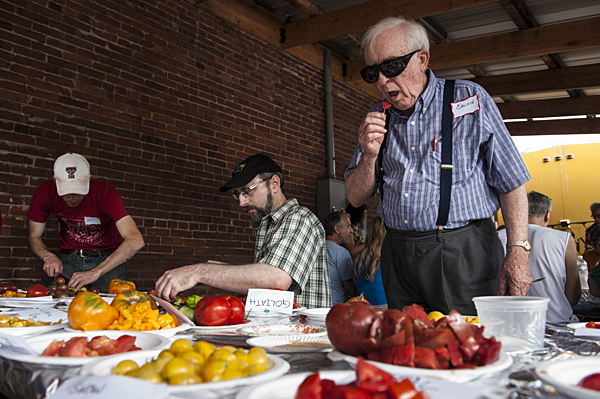 Close to one hundred tomato enthusiasts were stunned by the selection of heirloom tomatoes on hand at this year’s Tomato Tasting. 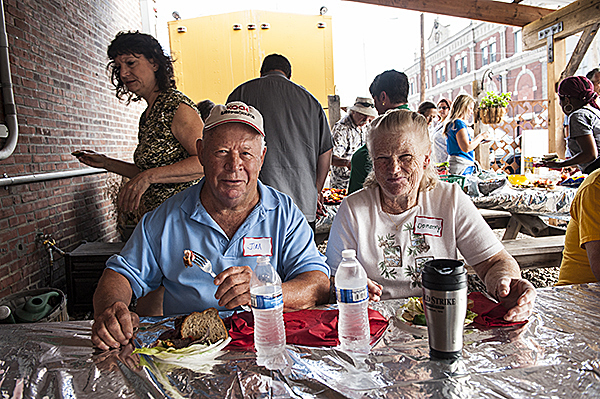 Hosted by Local Pig, the event was boosted by heaps of pork to add to tomato sandwiches. As each year ticks off, the festival becomes bigger and better, and shockingly, it is still free! 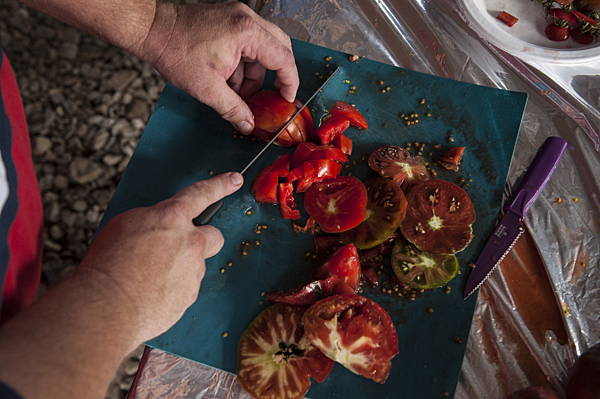 We look forward to meeting our fellow growers, discussing the growing season and sharing recipes. With the harvest delayed by a spring that was cold and wet, many local growers came up short to supply the event. Luckily, Bear Creek Farms stepped in and donated baskets of massive fruit to save the day. 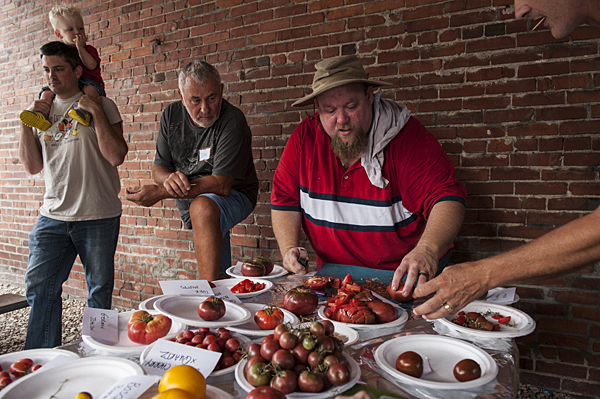 All in attendance had an opportunity to vote for their favorite tomato varieties. James Worley has posted the results of his tasting survey online. As for us, we can’t wait until next year. James and Todd make mincemeat out of the many varieties on hand. 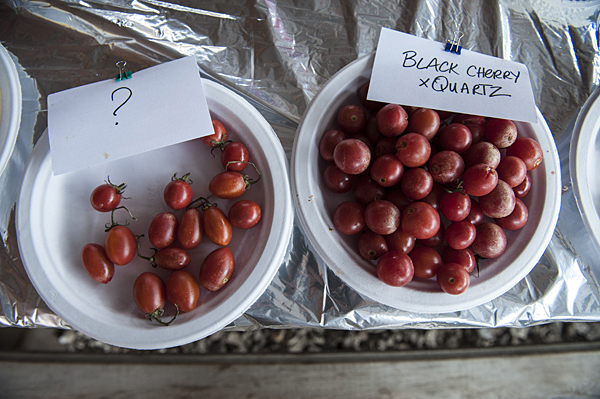 A mystery volunteer bumps up against Black Cherry Quartz a tomato described as having a champagne-like flavor. 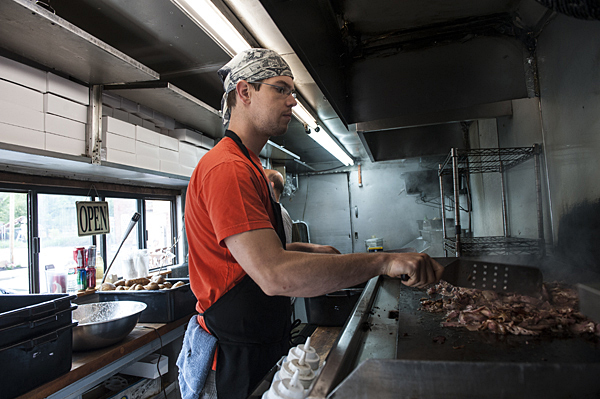 Andrew Heimburger, executive chef at the Local Pig food truck cooks up beef shortrib pastrami for tomato sandwiches. As the harried slicing continues, the tasting begins. 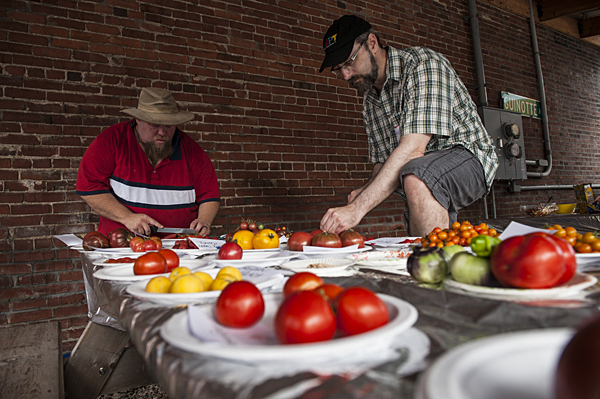 Black Krim and Black From Tula, two TomatoTown favorites. This entry was posted on Tuesday, August 6th, 2013 at 3:33 pm. It is filed under Event, Latest Posts. You can follow any responses to this entry through the RSS 2.0 feed. Had a great time, looking forward to better planning in 2015. Would anyone happen to know when 6th annual is going to happen?